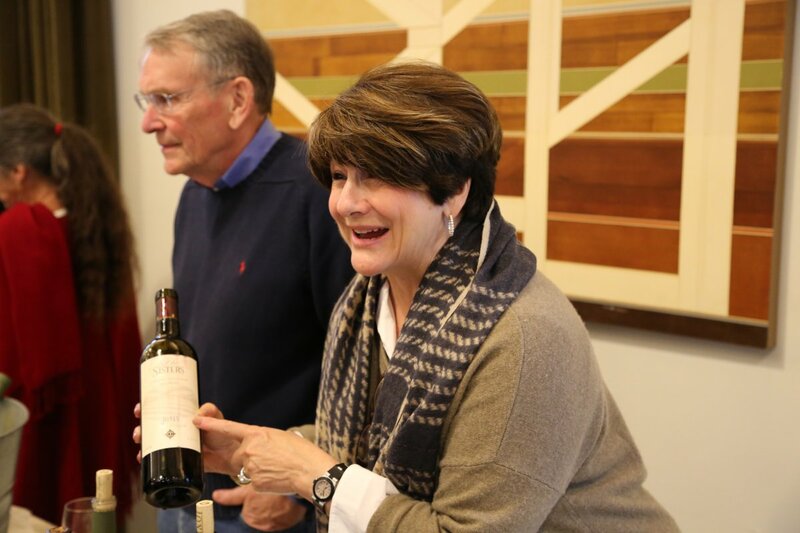 Jones Family Vineyards was founded by Rick and Sally Jones (Sally died in 2005), avid wine enthusiasts who developed a passion for drinking wine in the 1970’s while they were living in France. This certainly is not a bad place to immerse oneself into the culture of old world wines. Rick & Sally moved to the Napa area in 1991 and were able to purchase a premium vineyard that was being sold by Calistoga’s Araujo (now Eisele Estate). For several years Jones Family sold their fruit to a winery in the Stags Leap District and at the same time, made non commercial wine. 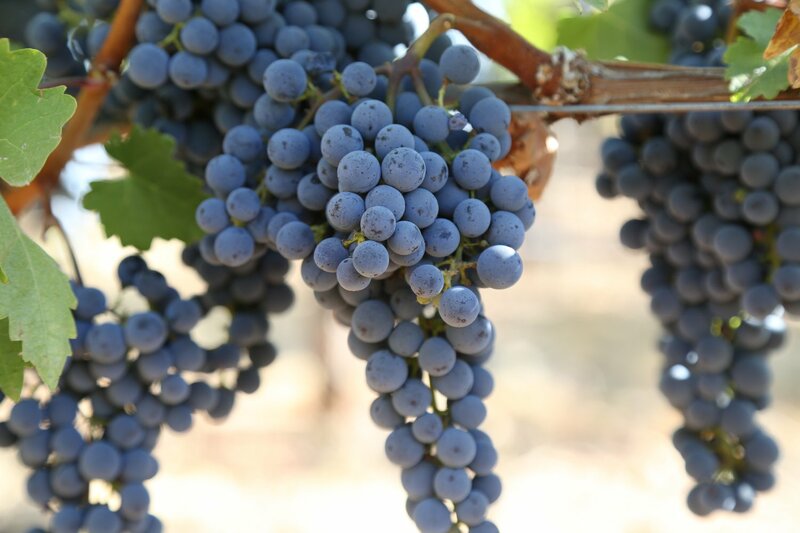 They knew their vineyard was quite capable of producing stellar Cabernet Sauvignon – both from tasting their own wine as well the wine from the wineries who were purchasing their fruit. Jones Family released their first commercial vintage in 1996 and currently focus on estate grown Cabernet Sauvignon. They employ two superstars in the local Napa Valley wine scene, vineyard manager David Abreu and winemaker Thomas Brown. Both have sterling reputations in the valley in their respective fields. As any winemaker will tell you, a large percentage of winemaking is done in the vineyards and it is up to the individuals managing the vineyards and the winemaker to bring forward the uniqueness of each vineyard site. Thomas Brown is one of the busiest wine makers in the Napa Valley. Several producers have showed us lists of all the Napa brands that he consults for and or provides direct winemaking services; this is an extensive list. He is from South Carolina and developed an interest in wine while attending the University of Virginia where his major was not wine related (he studied English and Economics). 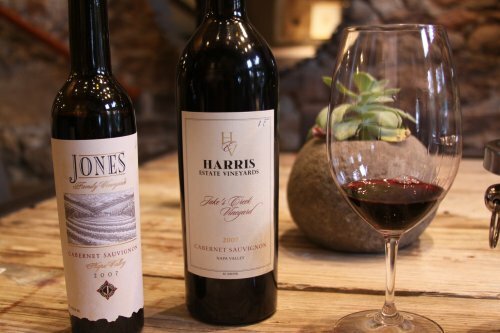 Jones Family owns three distinctive estate vineyards about 5 miles north of St Helena on the eastern side of the valley. Their vineyards are among the southern most vineyards in the Calistoga appellation. The elevation of the site ranges from 600 to 900 feet; the original 7 acres of vines (entirely Cabernet Sauvignon) were planted in the early 1990’s. Later vineyard architect and manager David Abreu oversaw the planting of another 3 acres of Cabernet Sauvignon – fruit from this vineyard is used in blending as well as in their second label, The Sisters. Like many parts of hillside Napa, their site is extremely rocky (volcanic in nature) with the vines growing in well drained soils (the roots must work their way deep to find water). While not dry farmed (farming this way in the hills is often not an option), the vines are watered as little as possible. And despite only having 10 acres to vine, the topography varies dramatically from almost flat to a 35% slope. And their vineyards are certified Napa Green (a certification program by Napa County Department of Public Works and the California Green Business Program overseeing water conservation and reduced energy and waste within Napa County based producers – a separate certification is given for both physical wineries and vineyards). Today Rick is still involved with his wife Elaine, however his two daughters Stephanie and Heather now run their sales, marketing and general operations. Even their husbands are wine enthusiasts and Rick told us have been known to help out from time to time on marketing related activities. It is truly a family run affair and hopefully the 3rd generation when of age, will be consumed by the “Napa allure” that is hard to resist when you grow up in a winemaking family in the Napa Valley. The 2007 Jones Family Estate Cabernet Sauvignon is 100% varietal; it is dark ruby in the glass with a complex bouquet that reveals a nice depth of aromas as it opens. It is an elegant nose – that shows some earth notes, chocolate, hints of baking spice and subtle fruit aromas including blackberry. The bouquet is elegant and refined. The mouth feel is rounded especially on the fore and mid palate but one can quickly tell this wine has power, especially towards the finish. Rich flavors and a robust structure linger for some time. This is a wine that certainly can be enjoyed now but will develop additional nuances and smoothness over time. 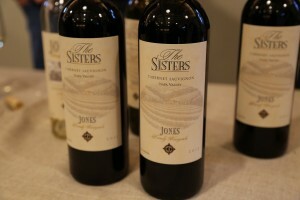 Jones Family produces a true second wine, appropriately named with the family in mind, called The Sisters. While from the exact same vineyard as their Estate Cabernet the wine style is decidedly different. This is more California in style using the same fruit as used in their Cabernet Sauvignon but depending on the year, is blended from specific blocks within the vineyard as well as with additional amounts of Cabernet Franc. The 2008 Jones Family Three Sisters is 100% varietal Cabernet Sauvignon hows explosive fruit on the bouquet – aromas of blackberry and black currant dominate – as the wine opens a pleasing earth component creeps into the bouquet. This is a very aromatic wine. The entry is surprisingly soft on the palate – the core of fruit is red rather than dark and the finish leaves well integrated dusty tannins as well as hints of mocha. Jones Family does not produce a lot of wine – each of the wines released is typically only around several hundred cases. As a result, the majority of their wine is distributed through their mailing list. You can also find their wine locally at several premium restaurants including the French Laundry in Yountville, and select restaurants in New York and London.